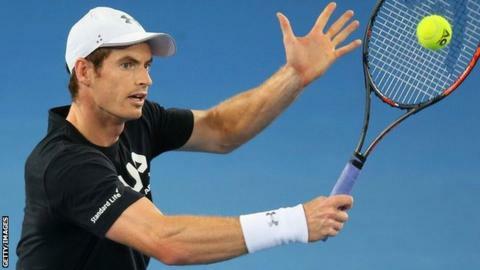 Britain's world number one Andy Murray will play Ukraine's Ilya Marchenko in the Australian Open first round. Murray was drawn in the same quarter as Roger Federer - meaning the pair could face each other in the last eight. The 29-year-old Scot is chasing a fourth Grand Slam title and his first in Melbourne, where he has reached the final five times. British world number 10 Johanna Konta, 25, will face Kirsten Flipkens from Belgium. Konta's draw places her in the same quarter as Slovakia's Dominika Cibulkova and American six-time champion Serena Williams. Heather Watson and Naomi Broady will both face Australian opponents, with Watson playing Sam Stosur and Broady up against Daria Gavrilova. Defending men's champion Novak Djokovic will be aiming for a record seventh Australian Open title with a first-round match against Fernando Verdasco. Spaniard Verdasco knocked his compatriot Rafael Nadal out in the opening round last year, but lost to Serb Djokovic in their recent meeting at the Qatar Open despite having five match points during a second-set tie-break. Nadal, seeded ninth, will play German Florian Mayer, before a possible quarter-final against Canadian Milos Raonic. Britain's three other male participants see Kyle Edmund face Santiago Giraldo, Dan Evans play Facundo Bagnis while Aljaz Bedene was paired with Victor Estrella Burgos. If Murray can safely find a way through his first week as a top seed at a Grand Slam, then he may have the chance to avenge last year's US Open quarter-final defeat by Kei Nishikori. But Federer may have something to say about that. Now seeded 17, after six months out through injury, the 17-time Grand Slam champion is in Nishikori's section of the draw. All the British men will face opening round opponents outside the world's top 50, but the women have a tougher draw. Flipkens brings the experience of a Wimbledon semi-final into her match with Konta, while Watson and Broady must both face seeded Australians. Sam Stosur has a very poor record in front of her home fans, however, which should give Watson cause for optimism. In the women's draw, Williams is aiming for a record 23rd Grand Slam title. Her first match will be against Swiss Belinda Bencic. Defending champion Angelique Kerber will play 61st-ranked Ukrainian Lesia Tsurenko. World number one Kerber is aiming for her third Grand Slam win following her maiden US Open title last year. Konta is in good form heading into the tournament. She beat world number three Agnieszka Radwanska 6-4 6-2 to win the Sydney International on Friday.